Some CarPlay users may prefer to use Google Maps on CarPlay, instead of Apple Maps. Using Google Maps on CarPlay is simple, and you can easily replace the maps icon on a CarPlay unit with Google Maps (or even Waze) if desired. We’ll show you how to add Google Maps to CarPlay and also how to replace Apple Maps with Google Maps if it’s your preferred mapping, navigation, and directions tool. 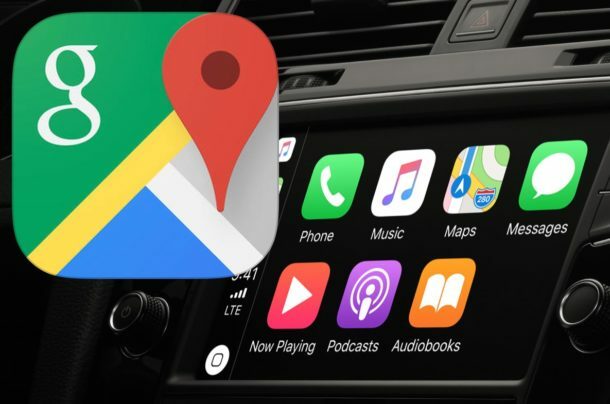 Requirements to use Google Maps on CarPlay are fairly straight forward: the iPhone must be running iOS 12 or later, the iPhone must have a new version of Google Maps (update the app if you aren’t sure or download it from App Store), and you must have a CarPlay car or CarPlay receiver. Beyond that, you simply need to have CarPlay setup with iPhone, and you’re ready to go. Now you simply launch Google Maps on CarPlay as you would any other CarPlay app, and you’re using Google Maps with CarPlay. Note that it’s not currently possible to completely replace Apple Maps with Google Maps for default behavior or things like Siri navigation requests, but it’s possible that will change down the road. If you’re not sure how to setup and use CarPlay, you can follow these instructions to get that configured. Not all cars support CarPlay by default, and some require a third party CarPlay compatible stereo to be installed to gain the feature. Many of the general Google Maps tips for driving will work on CarPlay whether for voice navigation or otherwise, but obviously those that are specific to a phone or desktop app will be different or unavailable. Can I replace Google Maps as CarPlay default for Siri instead of Apple Maps? Whether you have Google Maps on the iPhone with CarPlay or not, Siri will continue to use Apple Maps as the default if you summon for Siri and ask for directions or navigation somewhere. Thus if you want to use Google Maps as the default, you must open it manually on CarPlay rather than by asking for directions from Siri. Basically this means if you want to replace Apple Maps with Google Maps on CarPlay, you have to move Google Maps to be more prominent while putting Apple Maps somewhere less prominent, then remember to launch Google Maps instead. This may change down the road, but currently that’s the way CarPlay and Maps work together. Do you know of any other interesting tips, tricks, or solutions for getting Google Maps working well with CarPlay? Share with us in the comments below! We have the ability to ask Siri to open Google Maps. This works. But once Google Maps is open, is it possible to initiate the search using Google Speech through the car’s voice activation/Carplay mic?